We’re wrapping up this semester’s posts by reviewing – aiming to synopsise – two published texts that might be part of your individualised Journal Club reading this summer. Both piece questions the language used within education to label products (“high quality”) or recommend practices (“best practices”), even as products and practices “can never be singular, fixed or absolute, a specification handed down or imposed from above” (Coffield and Edwards), even as “innovation” calls for invention of new and untested practices as well as for making mash ups from existing practices. As teachers and authors, David Wiley, Frank Coffield and Sheila Edward offer their questions in order to reframe – through reflection and research – the core issue: not to affix labels on products and practices before we use them in the classroom, but to plan, design for, and evaluate the effectiveness of teaching/learning materials as these come to support learning for contexts each of us might uniquely require and specify. Recently the phrase “high quality” has come up several times in discussions of educational materials, and I’ve been surprised what a strong, negative reaction I’ve been having each time I heard the word. It’s very easy to demonstrate that “the degree to which it supports learning” is the only characteristic of an educational resource that matters. If an educational resource is written by experts, copyedited by professionals, reviewed by peers, laid out by graphic designers, contains beautiful imagery, and is provided in multiple formats, but fails to support learning, is it appropriate for us to call it “high quality”? No. No, no, no. A thousand times no. Despite this fact, which is intuitively obvious, when people say “high quality” they actually mean all these things (author credentials, review by faculty, copyediting, etc.) except effectiveness. In the world of textbooks and other educational materials, “high quality” describes the authoring and editorial process, and is literally unrelated to whether or not the educational resource supports learning. In this way, saying “high quality” obscures the issue we should care about most. Instead of letting people and companies off the hook by checking boxes during the pre-publication process, we should care about whether or not a particular resource supports learning for each of our particular students. Seen this way, the true desideratum of educational materials is “effective.” I really don’t care what the pre-publication processes was like as long as my students are learning (unless the process was unethical in some way). So please – let’s stop saying “high quality.” We don’t want “high quality” educational materials – we want “effective” educational materials. In the future, when you catch yourself saying “high quality,” stop and correct yourself. When you hear others say “high quality,” take that teachable moment to help them understand that the phrase is a ruse. If we can change this one element of the education conversation, we’ll have done something powerful. Frank Coffield and Sheila Edward. “Rolling out ‘good’, ‘best’ and ‘excellent’ practice. What next? Perfect practice?” British Educational Research Journal 35.3 (June 2009): 371–390. 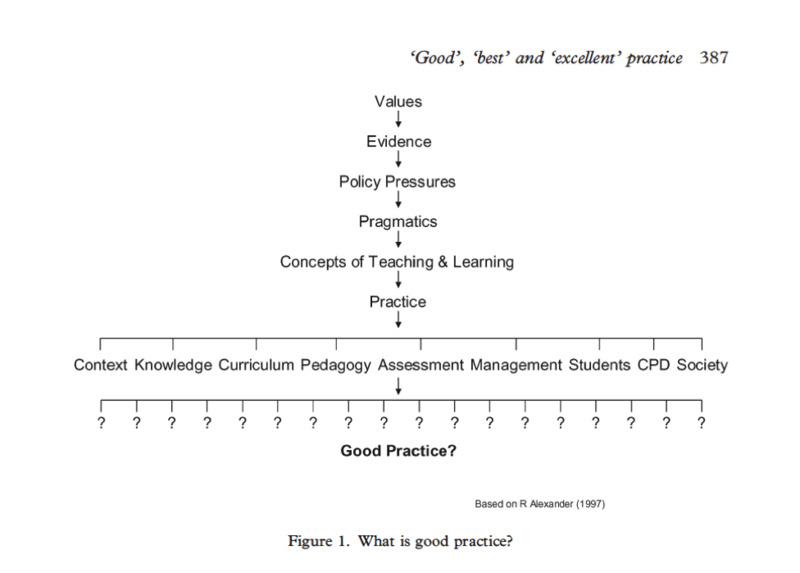 [I]n an attempt to answer the question: What is ‘good practice’? Figure 1 sets out a typical intellectual journey which skilled and experienced practitioners are likely to follow in their own inimitable and probably implicit way. Most tutors are likely to agree that the five dimensions are not all equally important, and there is likely to be considerable debate about what order they should be placed in. Figure 1 presents one possible way of proceeding. Political – What practices do educationally-powerful groups suggest I use? Evaluative – What practices do I most value or best fit with my values? Empirical – What practices has research shown to be most effective? Pragmatic – What practices work for me and which do not? Conceptual – How do I marry my answers to the questions above to the essential elements of practice? What conceptions do I have of good teaching and good learning? What localities do teachers and students come from, and how should that impinge on my practice? How is the ‘codified’ knowledge learned in college to be related to the ‘situated’ knowledge of the workplace? What selection of knowledge should be presented to these students? Do my teaching methods dovetail with the subject I’m teaching? What is the backwash effect of the assessment criteria on my teaching and students’ learning? How do I plan, sequence and evaluate my practice? And what constraints have been imposed on my teaching by institutional/legislative policies and by expectations/policy set by senior management? What are their needs, capabilities and understandings? What more do I need to know about teaching and learning? What influence are local labour markets or particular employers having on my students, the college and its courses? Combined with Alexander’s summing up – “[G]ood practice, created as it is in the unique setting of the classroom by the ideas and actions of teachers and pupils, can never be singular, fixed or absolute, a specification handed down or imposed from above” – these ideas can help us as teachers in the work of going beyond the gloss of high quality to dig into the core task of developing highly effective learning practices, to fill in the question marks at the bottom of Figure 1 for ourselves.